JJ, aka John Shaft Jr., may be a cyber security expert with a degree from MIT, but to uncover the truth behind his best friend’s untimely death, he needs an education only his dad can provide. Absent throughout JJ’s youth, the legendary locked-and-loaded John Shaft agrees to help his progeny navigate Harlem’s heroin-infested underbelly. And while JJ’s own FBI analyst’s badge may clash with his dad’s trademark leather duster, there’s no denying family. Besides, Shaft’s got an agenda of his own, and a score to settle that’s professional and personal. 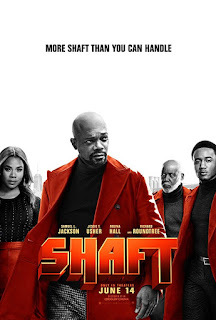 Written by Kenya Barris & Alex Barnow and based upon the character John Shaft from the novel by Ernest Tidyman, Tim Story directs this all-new take on a legend, starring Samuel L. Jackson in a reprisal of his role in the 2000 remake, alongside Jessie T. Usher, Regina Hall, Alexandra Shipp, Matt Lauria, Titus Welliver and Cliff “Method Man” Smith. Richard Roundtree also reprises his role from the 2000 remake... AND the 1971 original. He is, after all, the original Shaft. John Shaft. The film hits cinemas in June.